College application season is officially in full swing. And as tedious as it is to fill out those zillions of fields on the apps, we all know the most stressful part is the personal statement. 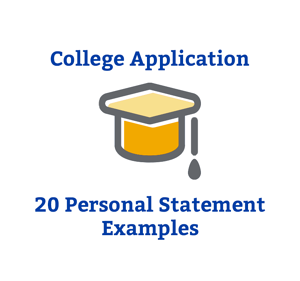 Take a look at our examples (including detailed notes on why these examples are so awesome), and then head over to our College Application Essay Lab for a step-by-step guide to getting your essay where it needs to be. Make 'em laugh. Make 'em cry. Just make 'em do something. Those admissions officers want to feel something...other than an eye roll.